← What’s New for 2013? Kate hasn’t captured well in this photo how much I’m enjoying myself sorting out the compost. I wished I had some ‘after’ photos to share to show how much better organised our compost area is. The Grumpy Vegan blog is 7 years old this month! 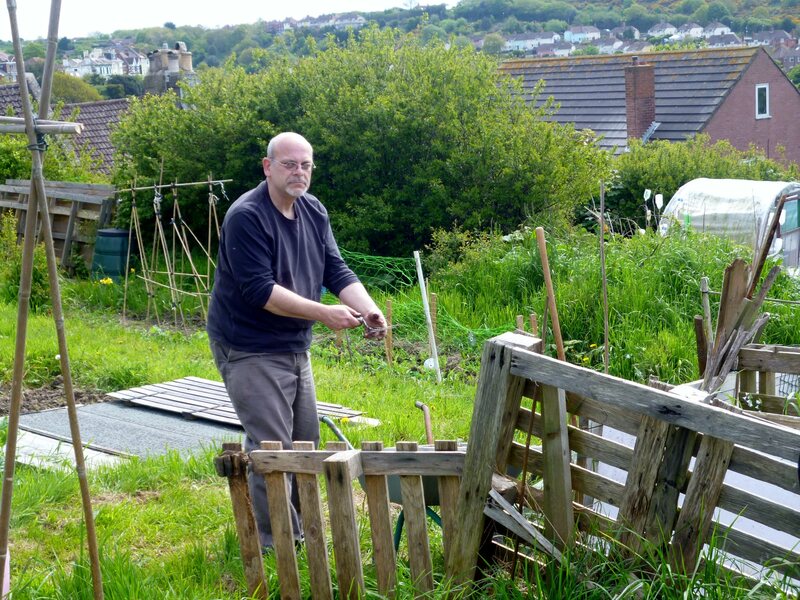 And what better way to celebrate can there be other than to share with you lucky people a photograph of yours truly working the compost at our allotment at Fernbank? I may not look happy but I was enjoying myself. There’s no greater satisfaction to be had — well, there are others but I won’t go into them here — than to sort out one’s compost. This entailed forking out compost made from our household’s vegetable and plant waste. Then, I fork through it by hand, sorting it to remove any unwanted, yet-to-be-broken down material which I put back into the compost. 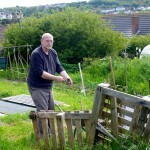 Then, I wheelbarrow our home-made compost over to the fruit trees and spread it around the base of each one. The next step is to fork over into the now empty bay all remaining compost material. This is stuff that is still breaking down. I put wood and old carpet on the top as it helps with the composting process. This means that there should be another batch of compost in the autumn. Also, there is a new bay ready for all subsequent vegetable and plant waste taken to the allotment. We’ve already cropped rhubarb and, as is evident from my photograph, I’ve baked some delicious rhubarb crumbles and rhubarb muffins. I always stew my rhubarb with dates–never sugar. This year’s crop looks promising. There are many flowers on the strawberries. The raspberry plants are growing really well. The fruit trees have flowered but they are still young and still may not crop yet. 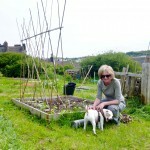 Here’s Kate proudly showing off some of the beans she’s grown from seed and planted at the allotment. Shelly isn’t too impressed, however. Note the glorious compost bin behind her. Our friend Kate grew from seed some beans which she planted in other beds. So, perhaps, our diabolical winter and spring will be compensated by a pleasant summer and a bountiful harvest from the allotment! 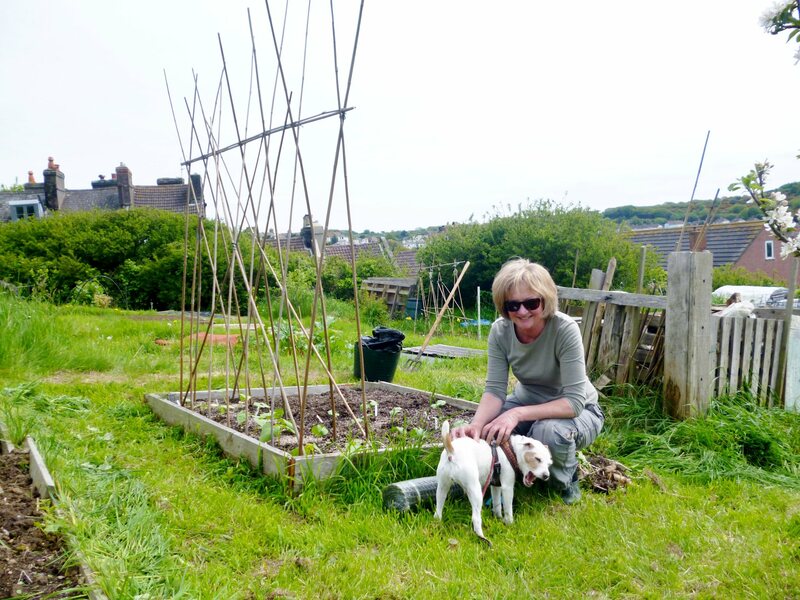 This entry was posted in The Grumpy Vegan Life and tagged Fernbank Allotment Hastings, Glimpses into the Private Life of the Grumpy Vegan, Living the Grumpy Vegan Life. Bookmark the permalink. 2 Responses to Seven Years Old! Congratulations, Kim, on seven years of blogging. I always appreciate your voice of experience and humor. Oh, and I can attest to the deliciousness of those rhubarb crumbles. Keep up your excellent work! Kim, I love reading your insights and observations of the world around us. Keep it coming!